If you make an error on the form we preserve all the data you entered so you only have to correct the question that was wrong and don't have to start again. We remember all values you entered from last time you completed an entry (including answers to custom questions), no matter how long ago that was. We give you the option to save your payment method so you can pay with one click next time. Following this step users can see your entry form, but before they do that they have to stop and think whether or not they have an account. This as an extra step, and each extra step is likely to lead to some people dropping out of the process. 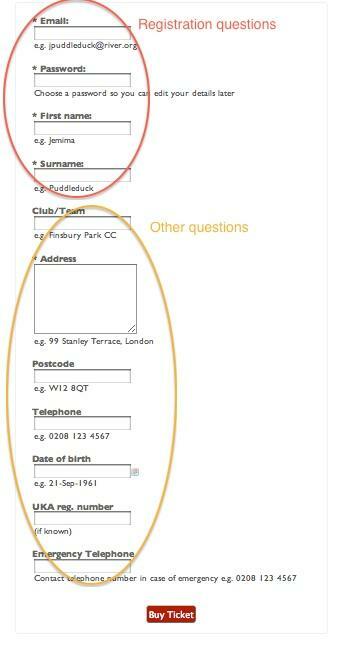 We build the registration questions into entry form itself ('inline' it). This is more friendly because users can immediately see the entire form - there is no process to drop out of, because there is only one step to complete. We still allow user accounts, and saving of user data, in fact if you're logged in already the 'registration' questions disappear from the form. However, we avoid presenting the new entrant with a 'barrier' to get past, and let them get on with what they came to do (enter your event) immediately.